The classic chesterfield design is remade for the contemporary home with the Madeline Collection. 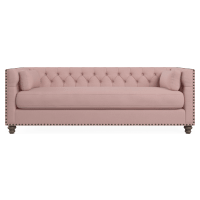 Featuring 3 seater sofas and armchairs upholstered in durable soft touch cotton linen fabrics in a wide spectrum of color ways, the Madeline is a perfect blend of classic design and modern tastes. With soft feather down and foam cushioning the Madeline sofa collection is as comfortable as it is eye catching.